Before he died during the plague of 1348, Giovanni d'Andrea wrote what became the standard commentary ('Glossa Ordinaria') used as a textbook on the 'Sixth Book of Decretals'. 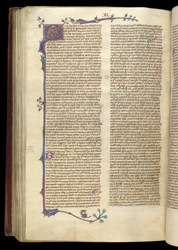 It often was copied in manuscripts, as in this one, on its own without the 'Sext'. The small creature on the decorative frame provides some diversion from the heavy going of the law text. Giovanni's daughter, Novella, followed in her father's footsteps as law professor at Bologna.